Fool Me Twice, Shame On Me: Do You Want To Go Get Ice Cream? It always started the same. “Do you want to go get ice-cream?” he would ask. I would nod my head, and follow him out through the screened-in porch of the old house he and my grandmother rented. This ritual typically took place in the evening hours, and I always remember it being muggy. I’d hop into his tow truck, and we’d head down Main Street in silence. When you grow up in a small town, everything is conveniently packed into one location, so travel time and destination are often irrelevant conversation pieces. Even at my young age, I knew these routine trips ended in one of two places, either the Dairy Queen where I was promised we were going, or the Laundromat where I knew we shouldn’t be going. Most of the time, I didn’t get ice-cream. My grandfather would take a deep breathe, look over at me, and tell me he needed to stop in at the laundromat to see his friend, Buddy, for a minute. I didn’t understand why we needed to go to a laundromat so much, or how my grandfather even encountered the owner of this local establishment. My grandmother, born and raised in the back woods of McLeansboro, IL, didn’t own a washing machine until the early 1990’s. She still used a ringer washer, and hung all her clothes out to dry- even in the winter. We had no practical purpose for frequenting this business. None the less, my grandfather seemed to have a relationship with this rough looking man named Buddy, and going to go get ice-cream usually meant we were going to see this man instead. At the hours we visited, not too many people were ever there doing laundry. Most of the time the place was quiet, except the whirring of a dryer tumbling or the buzzing of an overhead fluorescent light. If the windows were open, you could hear the occasional sizzle of a fly losing his battle against the archaic bug zapper just above the entryway. I didn’t really like the laundromat, or Buddy for that matter, but I was taught never to question adults. My grandfather would lift me up and set my on the counter next to the huge washtub sink like I was a sack of clothing. Sometimes he’d plop a quarter into this pea green colored vending machine and provide me with a Dixie Cup full of what was supposed to be hot chocolate. It looked more like old coffee, and it had an iridescent film I could see my reflection in. I took it anyway, because I was taught to always take what adults give you without complaining. My grandfather would then go into another room with Buddy to “talk.” I knew I’d be on that counter, holding my unsavory cup of hot chocolate, for anywhere between 5 minutes to a couple of hours. They would shut the door, but the walls were half plywood and half plexiglass. I could see them talking, their arms flailing as their voices ebbed and flowed. I could never make out the words, but I knew the conversation was one of those adult conversations. Like most of the lessons I had learned so far in my life, I knew this was one of those times when it would be best to stay put, maybe blend into my surroundings or imagine myself invisible. When done, my grandfather would leave the room, slam the door, and gesture for me to head outside. I would silently follow his lead, and we’d ride back home without words. My grandmother would be waiting for us back home in her housecoat, her Southern equivalent to a robe, and instantly she’d begin bombarding him with questions. Where did you go? What took so long? Do you know how late it is? He never answered, he’d just lower his head and go straight to his chair. Then she would turn to me. Much more calmly, she would ask me if we got ice-cream. I would look at my grandfather and then back at her, and then sheepishly reply that we hadn’t. I would always tell her exactly where we had been, even though my grandfather had said, “Don’t tell your grandmother!” just before we entered the house. That’s when the arguing would usually begin. I’d just go find some paper and draw, or I’d put myself to bed. I think of this story whenever I hear that Chinese proverb Fool me once; shame on you. Fool me twice; shame on me. 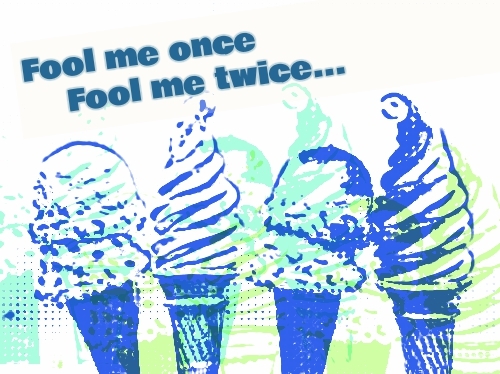 I have been called a fool many times in my life for “falling” for people’s misdeeds. Many times friends and loved ones have accused me of being naive, gullible, or downright ignorant for allowing people to take advantage of my willingness to go along with things. This isn’t the only instance like this in my life. I routinely give people many chances, and I “put up with a lot of nonsense from people,” so I’ve been told. People either pity me or think I’m foolish, still others feel I get what I deserve. There is a reason, however, for what I do, and I don’t think it makes me weak or less intelligent than people who get disappointed in others for not living up to their expectations. Growing up around addiction and mental illness, you get accustomed to not always getting what you want. You see people you love on their good days and their bad days, and you recognize that people aren’t always able to provide for you, even if they want to. I suspect that my grandfather had a major issue with gambling, and he’d spend what little money he had on lottery tickets and possibly other things I know nothing about. He was always trying to borrow money from people, and I’m sure this “friend” at the laundromat was someone that loaned him money or placed bets for him, maybe both. I believe my grandfather really wanted take me for ice-cream, but he wasn’t capable of controlling that urge to do that “other thing” once we were driving. I could always see the hesitation in his eyes, and the atmosphere would grow heavy with his sighs, before he finally decided to turn left instead of right. He had lost control, and his choice had very little to do with me at that point. I went with him every time because he asked me to. He wanted me there, even though he knew that I was going to tell my grandmother where we had been. I wonder now if he wanted people to know that he was losing control. I wonder if he was looking for someone to take control for him, but another lesson you learn from being around people with addictions rather quickly is that you can’t control people. You can only control how you respond to people and situations. For me, I was willing to take the chance of not getting ice-cream to spend time with my grandfather. I take that same chance with all people I guess. I am keenly aware of what people are up to, and I’m far from being naive. I am not weak. As an extremely sensitive person, I have had to learn how to separate my emotions from the actions and reactions of others. That’s how I control my world. It’s my decision whether or not I give someone a second chance, and I only take that chance if I know I’m going to be able to live with the worst case scenario. I’m an observer, and I enjoy thinking about people’s motivations. I enjoy their good days, and I don’t personalize their bad days for my own sanity. In life you have to take chances on people and be willing to get a bitter cup of hot chocolate instead of a delicious dish of ice-cream sometimes. When people that can’t always deliver are able to provide that treat, it’s an amazing experience. It’s one I never want to miss, and which is probably why I give people more chances than I should. If they don’t deliver, I’m still not a fool for going along with them. At the end of the day, I’m pretty street smart. If I really want ice-cream, I know how to get it on my own.